Two new projects will grease the wheels for foot-and-pedal commuters traveling between inner Northeast Portland neighborhoods, planners say. 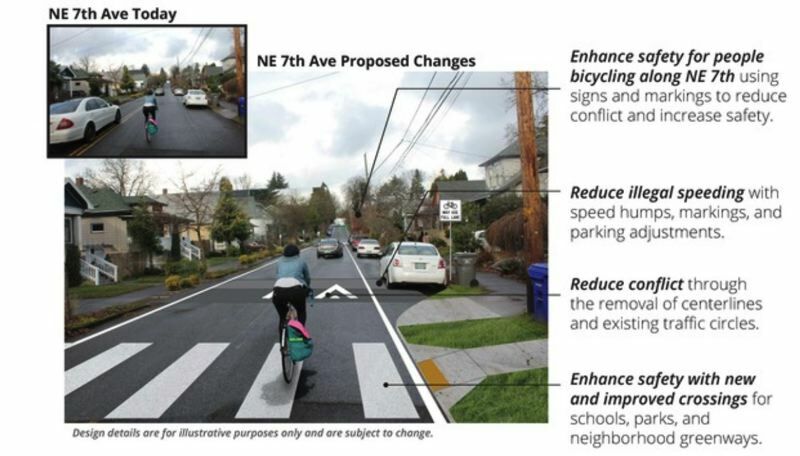 The Portland Bureau of Transportation announced it will create a new neighborhood greenway for hikers and bikers along Northeast Ninth Avenue and similarly improve conditions on Seventh Avenue as part of the Lloyd to Woodlawn program. After construction begins in spring 2020, locals can expect to find prominently striped pedestrian crossings, speed bumps to slow leadfoot drivers, new diverters to prevent cut-through traffic, extended bike lanes, wayfinding signs and adjustments to on-street parking. "We're so grateful for the black community's engagement in this process," Interim Transportation Director Chris Warner said in a statement Thursday, March 21. "All of us want safer streets for our children and to get to where we are going comfortably, efficiently and affordably, no matter how we travel." 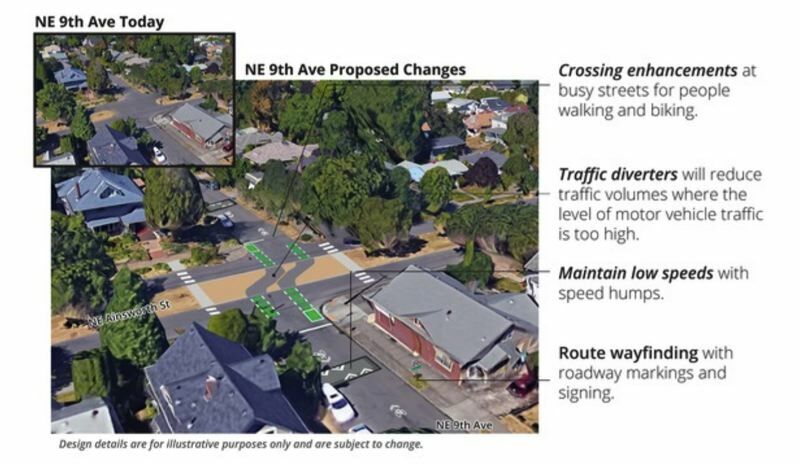 The traffic diverters are proposed along Ninth as it crosses Ainsworth, Emerson and Webster streets, as officials say too many drivers are using those spots to avoid congestion on more auto-oriented north-south arterials. On Seventh, workers will add path markers, street paint and re-adjust stop sign locations at the intersections with Going, Morris and Tillamook streets. PBOT says it will additionally remove existing traffic circles and orange centerlines in order to "reduce conflict between people." The final leg of the project builds a Seventh Avenue bike lane from Weidler to Tillamook streets, one of the final links in the chain for the Sullivan's Crossing bridge over Interstate 84, which is slated for construction in 2020 as well. The project will help residents enjoy a stress-free walking and riding route between the Lloyd District and the Woodlawn, Vernon, Sabin, King and Irvington neighborhoods. It will also establish connections to Martin Luther King Jr. Elementary School, Two Plum Park, Irving Park and the Albina Head Start. "Throughout the process, PBOT was open to listening, learning and responding to community concerns," said Ron Herndon, director of the head start founded in 1965. "As a result, these projects are a fair representation of the community and neighborhood's interests." At this point, the transit bureau has released a $552,000 price tag for the project, with funding allotted from the city's 10-cent gas tax. PBOT says that amount will cover design, engineering and "partial implementation."